How Much Are You Bothered By Your Car's Rusty Rotors? “I hate how our car’s brakes always rust,” my parents often tell me when I visit them. They own a 2015 BMW 320i, and they love it. What they don’t love is seeing nasty orange oxidation on an otherwise beautifully maintained machine, but unfortunately, they’re just going to have to deal with that. Because few cars, not even the Porsche 911 above, are immune to The Orange Blanket that is Fe2O3. It’s a beautiful machine, and with a price tag of well over $100,000, you’d expect it to be. This particular one was being used to showcase Porsche Exclusive Manufactur, which is basically a program that lets people personalize their Porsches with unique colors and trim options. As you can imagine, it had been meticulously cleaned and polished before any journalists could get near it. To be clear, this is perfectly normal, and not at all a dig at Porsche. Cast iron plus moisture plus oxygen plus a bit of heat, and you’ll get rust on any rotor in no-time. I myself actually don’t find a bit of orange on a rotor to be aesthetically displeasing, but plenty of people do, and ever since talking with my parents about their 3 Series, I just can’t stop noticing it. 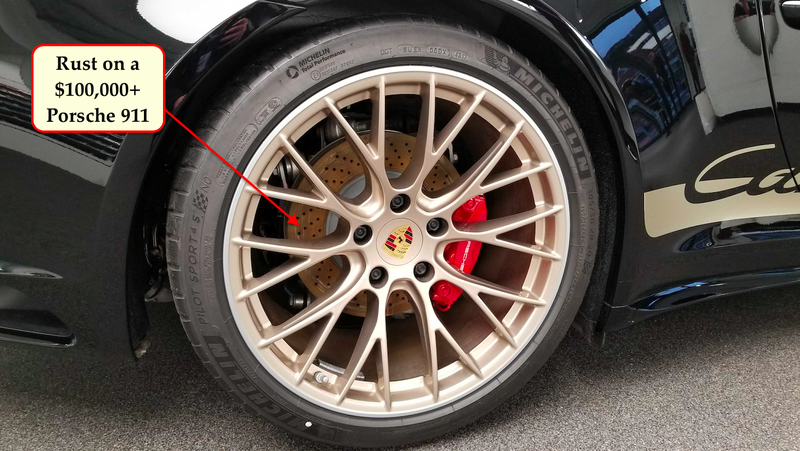 More expensive carbon-ceramic rotors do offer more corrosion protection than iron rotors, but those tend to be rare, and even expensive cars like 911s still like to clamp their calipers to ferrous metals. Plenty of companies coat their rotors with an anti-corrosive layer, but that really only keeps the center hub and outer edges from rusting, as the brake pads wear away at the coating on the swept surface. That’s okay, though, because the pads will also wear away at the surface rust—just go for a little drive, hit the brakes a few times, and that iron should be shiny as a mirror. Still, I will admit that it’s a bit odd to see visible rust on a car as perfect as that 911. Does this bother any of you, too? That's Not Rust. This Is.